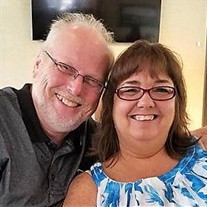 Steven L. Ramsey, age 53, of Blaine, passed away Friday, January 25, 2019, at Parkwest Medical in Knoxville. Above everything, Steve loved the Lord and his salvation. He was of Baptist faith, and a professed Christian since April 9, 2004. He was proud to be a US Navy veteran of four years and was stationed in Gaety, Italy, with Six Fleet Command on board the USS Puget Sound AD-38, then home ported in Norfolk, VA. He fell in love and married a fellow shipmate, Christine, who became his loving wife of 33 years. He loved life, his music, and his grandkids. They were his pride and joy, along with his beloved pets, Keira and Milo. He is preceded in death by his dad Garland Ramsey, Jr. He is survived by his loving wife Christine Ramsey; two sons Brandon Ramsey (Jessica Parker), and Aaron Ramsey (Leasa Brooks); his mother Barbara Ramsey; siblings Kimberela (Timothy) Pique, David (Jennifer) Ramsey, and Marty Ramsey; grandchildren Briahnna, Savannah, and Neyland Ramsey, Cayli Johnson, and Trinity Baxter Ramsey; numerous beloved nieces, nephews, and other family members, as well as his special QA Lab co-workers. The family will receive friends from 5:00 to 7:00 pm on Sunday, January 27, 2019, at Smith-Reagan Funeral Home in Rutledge, with funeral services to follow. Rev. Gary Satterfield will officiate the service. Graveside services will be held at 11:00 am on Monday, January 28, 2019, at Grainger Memorial Gardens.